Nigerian troops have started to leave the Bakassi peninsula, ahead of Friday's deadline to hand the oil-rich area over to Cameroon, the army says. Up to 3,000 troops will complete their withdrawal by next Monday, said Nigerian military spokesman Brig Gen Felix Chukwuma. In June, President Olusegun Obasanjo said he would abide by a World Court ruling that gave the area to Cameroon. 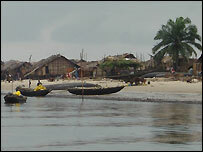 Most Bakassi inhabitants are Nigerian and oppose the handover. One group, the Bakassi Movement for Self Determination, has declared independence for the region, saying it would reject Cameroonian sovereignty. "The people have declared their own republic, known as the Democratic Republic of Bakassi. We will no longer have anything to do with Nigeria, since Nigeria does not want anything to do with us," said Tony Ene, the interim head of the movement. The BBC's Alex Last in Nigeria says most of the troops are expected to leave over the weekend, with an official ceremony to take place next Monday. The troop withdrawal will be monitored by Germany, the United Kingdom, France and the United States. A special transitional arrangement for the civilian administration will be in place for five years. The territorial dispute sparked military clashes between Nigeria and Cameroon during the 1990s, before both sides agreed to go to the International Court of Justice. Mr Obasanjo has tried to reassure Bakassi residents that their safety will be guaranteed even when Nigerian troops leave. Cameroon has pledged to respect the culture, language, beliefs, property and fishing rights of the peninsula's people, and not to impose "discriminatory" taxes. Residents have the choice of remaining in Bakassi with their Nigerian nationality, taking up Cameroonian citizenship or moving to other parts of Nigeria, such as nearby Cross-Rivers State. Bakassi juts into the Gulf of Guinea, an area which may contain up to 10% of the world's oil and gas reserves. It is also rich in fish. The 2002 International Court of Justice ruling was based on a 1913 treaty between the former colonial powers, Britain and Germany. The agreement also settles the border between Nigeria and Cameroon for 1,690km (1,056 miles) up to Lake Chad. Some villages further north have already been exchanged.